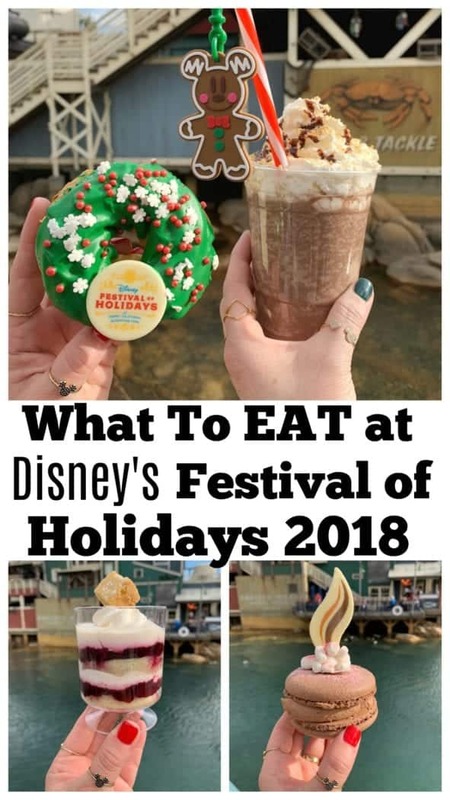 Sharing What To Eat Festival of Holidays 2018! 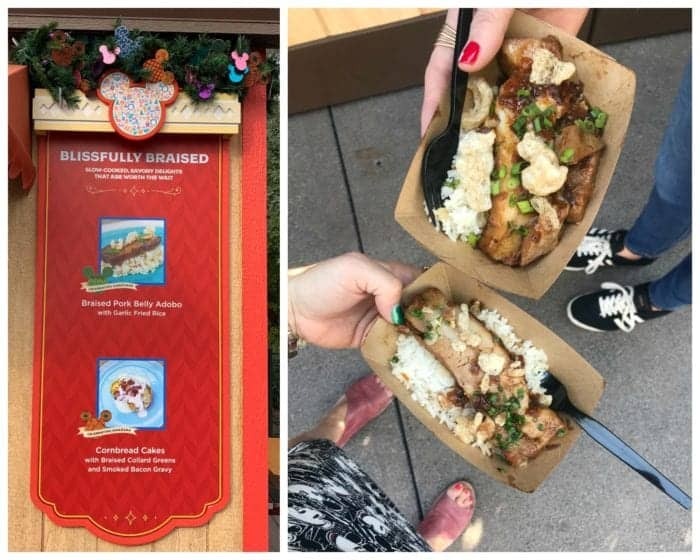 There are so many delicious menu items to try, grab your stretchy pants and enjoy some amazing bites! Festival of Holidays located at Disney California Adventure Park is a highlight for me every year! I look forward to seeing what kinds of delicious foods will be available. 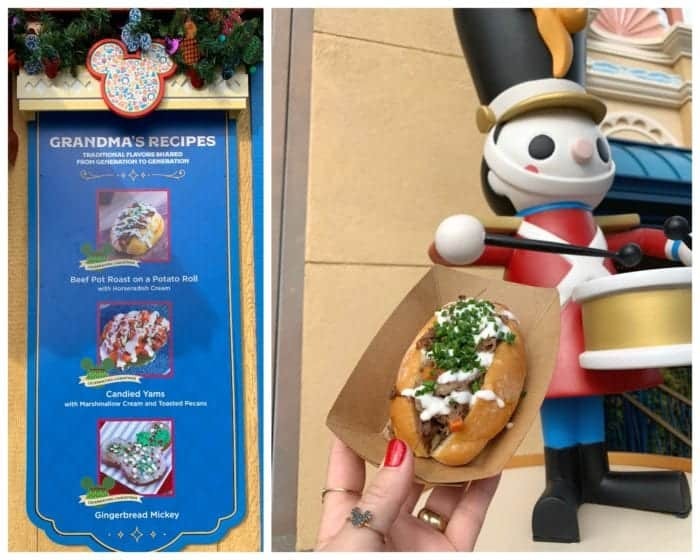 There is so much to EAT at Disneyland Resort during the Holidays, such an amazing time to visit. 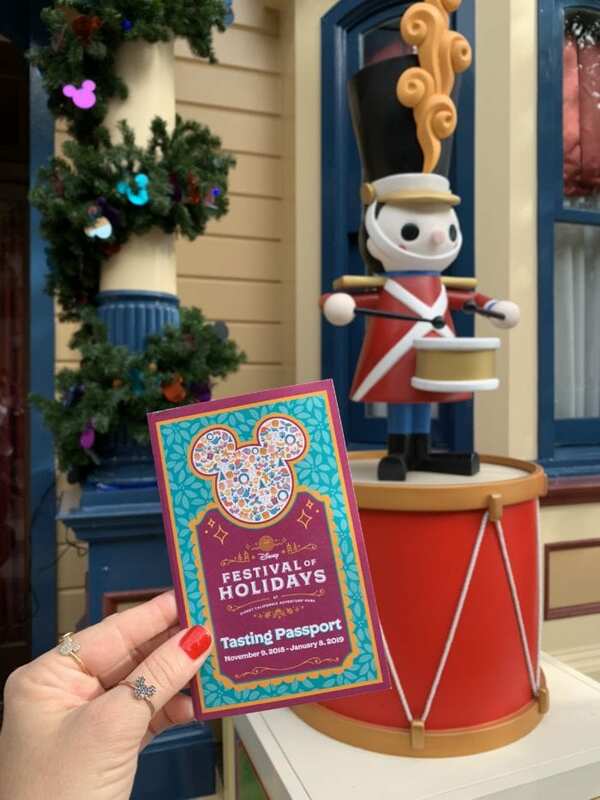 Find this Festival of Holidays Tasting Passport at the Marketplaces to help you map out your day! Festival of Holidays runs from November 9-January 8th 2019. One of my biggest tips for you is to purchase the Sip and Savor Pass. The Sip and Savor Pass, which consists of a commemorative credential, lanyard and 8 coupons, redeemable for food and beverage offerings (excluding alcohol). Each Sip and Savor Pass is $54, including tax. In addition to a reduced price, Annual Passholders will also receive a special Passholder lanyard as well as buttons (at participating marketplaces upon coupon redemption). To receive the Passholder price and keepsakes, a valid Annual Pass and photo ID must be shown upon purchase. 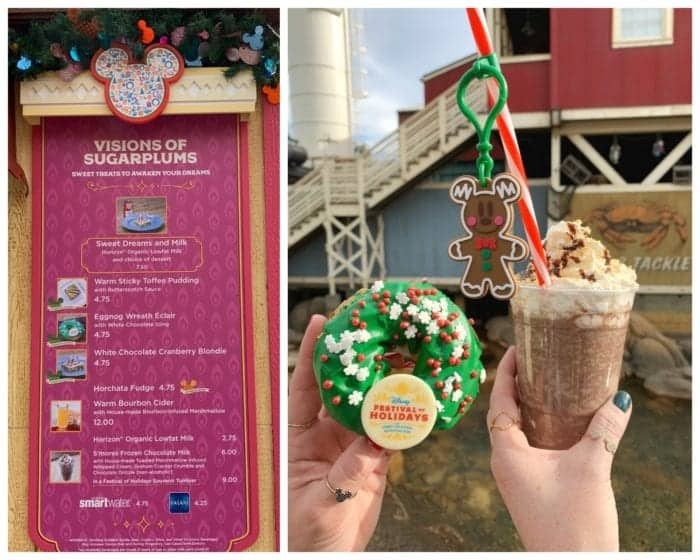 The Sip and Savor Pass is available for sale at Festival Merchandise Carts, Seaside Souvenirs (in Paradise Gardens Park), Holidays Central (near The Little Mermaid ~ Ariel’s Undersea Adventure), Kingswell Camera Shopand Rushin’ River Outfitters. 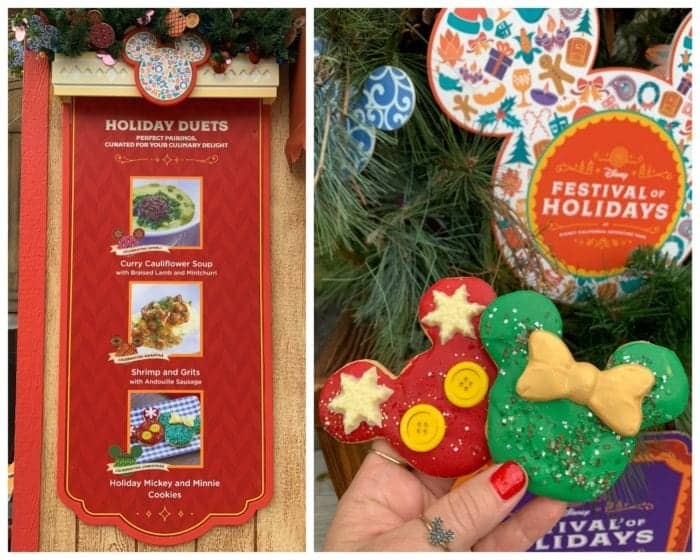 So get in touch with your inner foodie and sample these yuletide culinary creations November 9, 2018 through January 8, 2019 during Disney Festival of Holidays! I had one afternoon this year to check out the Festival of Holiday Marketplaces, so I’ll be sharing my favorites from my food crawl! 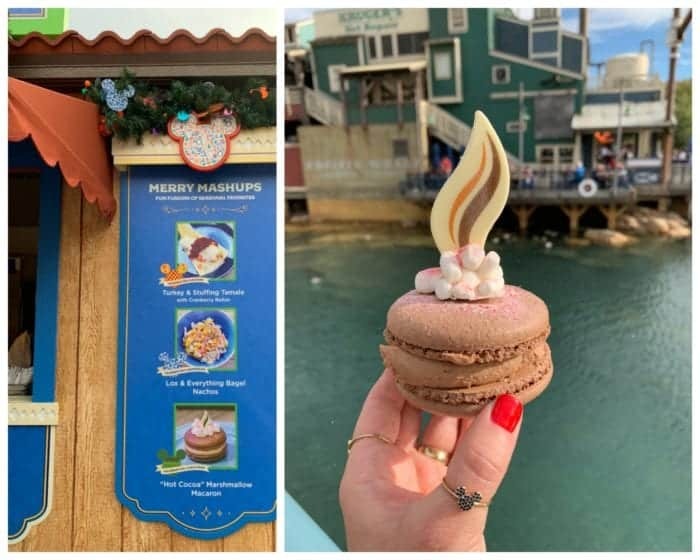 First up was the Hot Cocoa Marshmallow Macaron from the Merry Mashups Marketplace. This is a MUST. One of the best Disney Macarons I’ve had. It’s huge, so share with a buddy or two. 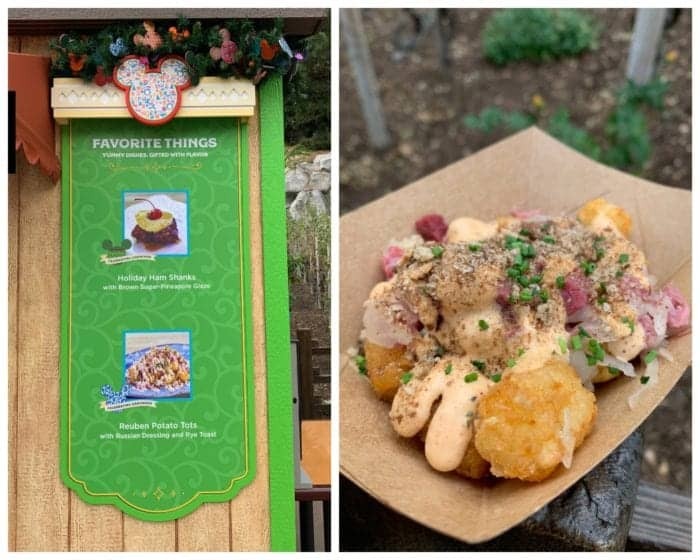 Over at the Favorite Things Marketplace I tried the Reuben Potato Tots. These were AMAZING. I would absolutely recommend these too. Winder Sliderland Marketplace….I’ve tried everything on the menu and I will say this is one of my favorite Marketplaces of the Festival. This is the Holiday Stuffing Mac & Cheese. It’s rich, flavorful and another one to share with a couple people. Really good. 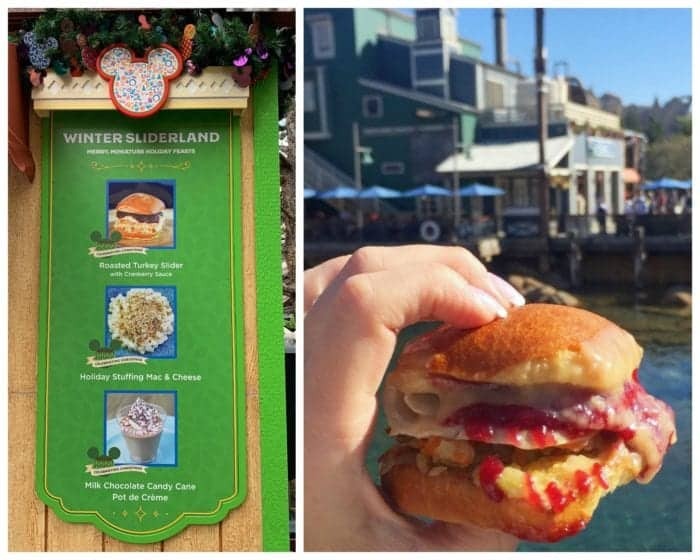 At the same Marketplace, the Roasted Turkey Slider is definitely a favorite. I’ve seen it available at the Festival for a few years now. It’s messy to eat, but really good. Just like Thanksgiving in a bun. 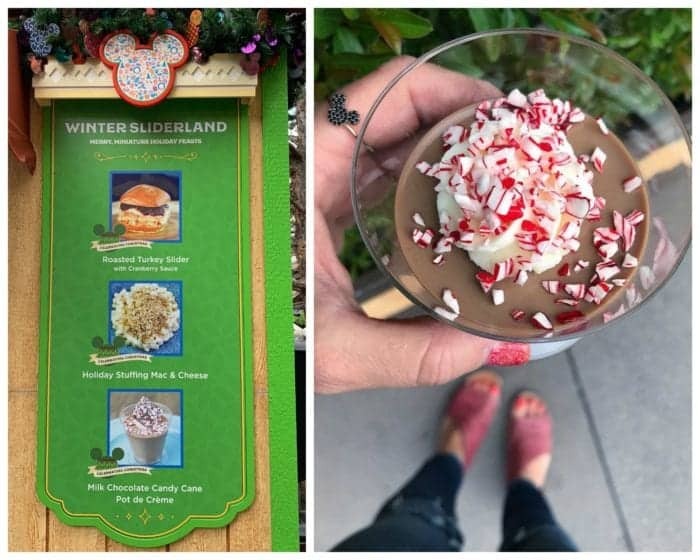 This is the Milk Chocolate Candy Cane Pot de Creme also available at Winter Sliderland Marketplace. It’s creamy, perfectly sweet and I would recommend this one too. Loved the candy cane bits on top. The Holiday Duets Marketplace was another hit. These Mickey and Minnie Sugar Cookies are perfect for grabbing on the go and snacking on throughout the day. These were good, but not one of my favorites. They are adorable though! 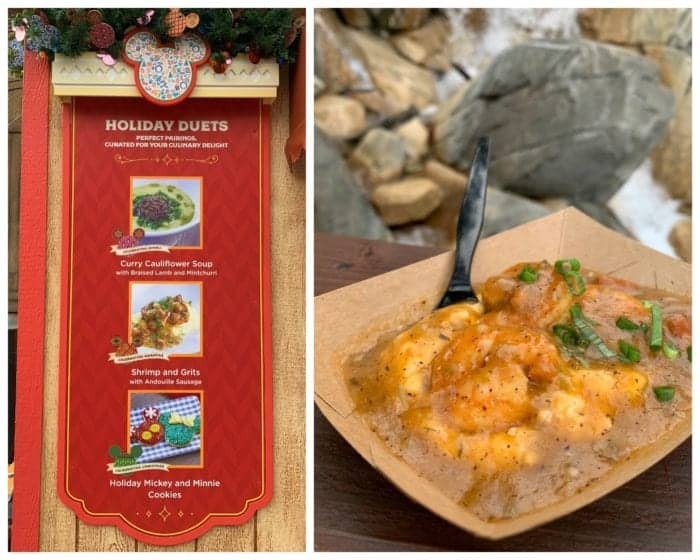 The Shrimp and Grits at Holiday Duets was good. I’d recommend sharing if you decide to get this one. Not one of my favorites, but fun to share to sample. 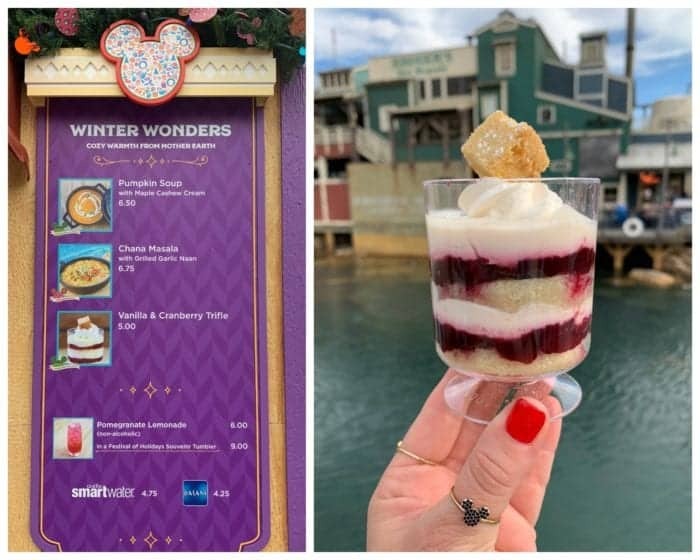 The Winter Wonders Marketplace has this Vanilla & Cranberry Trifle. This was another favorite of my afternoon. Loved the lemon/cranberry combo with sweet vanilla cake layers. You’ll love this one. 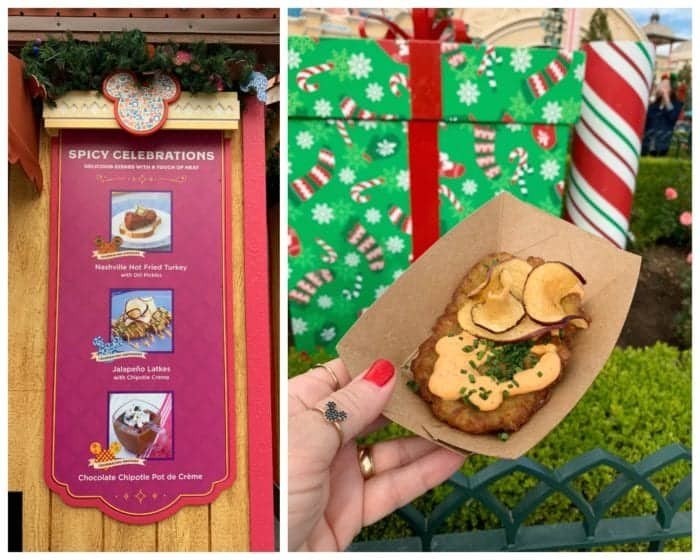 So Much Fun Food at Festival of Holidays! 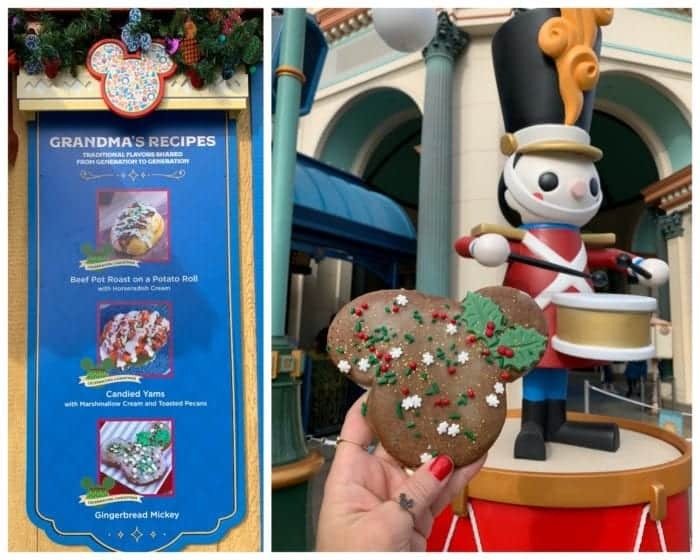 Over at Grandma’s Recipes Marketplace you can find this Gingerbread Mickey Cookie……it was FANTASTIC. Everything a spiced, soft gingerbread cookie should be. Grab this one to go, it comes in a nice package, great for taking on the go. Also at Grandma’s Recipes Marketplace is the Beef Pot Roast on a Potato Roll. This little hoagie was so flavorful. The roll was soft and it all just worked. I’d get this one again for sure. 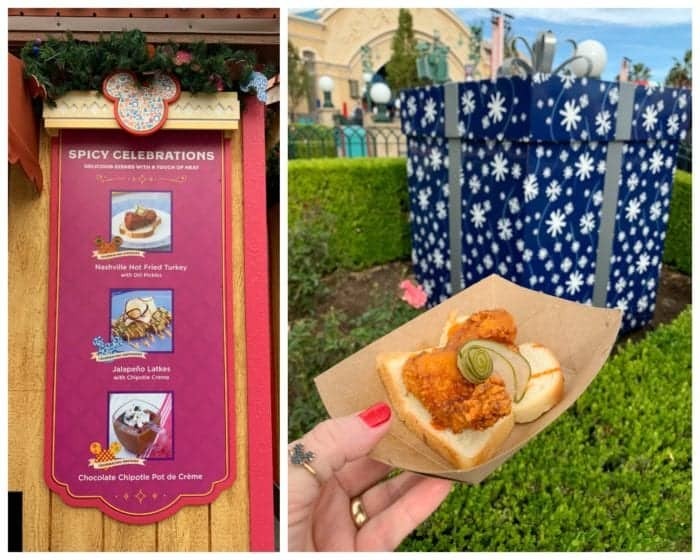 The Spicy Celebrations Marketplace has this Nashville Fried Turkey with Dill Pickle Toast. The fried turkey is spicy fantastic. If you don’t do spicy, skip this one. I really loved it. Also at Spicy Celebrations Marketplace, these Jalapeno Latkes really surprised me. They were absolutely delicious. A great plate to share so you can sample your way through the Marketplaces. Blissfully Braised Marketplace has the Braised Pork Belly Adobo. GET THIS ONE. It was a favorite last year, and it’s a favorite of mine this year. Flavors are spot on. Visions of Sugarplums Marketplace had this Eggnog Wreath Eclair and S’mores Frozen Chocolate Milk. My favorite was the S’mores Frozen Chocolate Milk. Even sampling so much food for the afternoon, I could have enjoyed the whole cup! Had to restrain myself, lol! 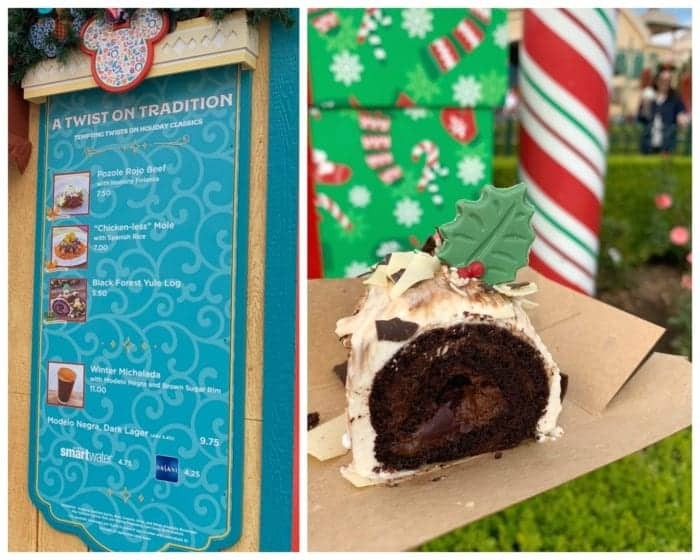 A Twist on Tradition Marketplace had this Black Forrest Yule Log. It was cute…..but not one I’d order again. I’d try one of the savory dishes on my next visit. 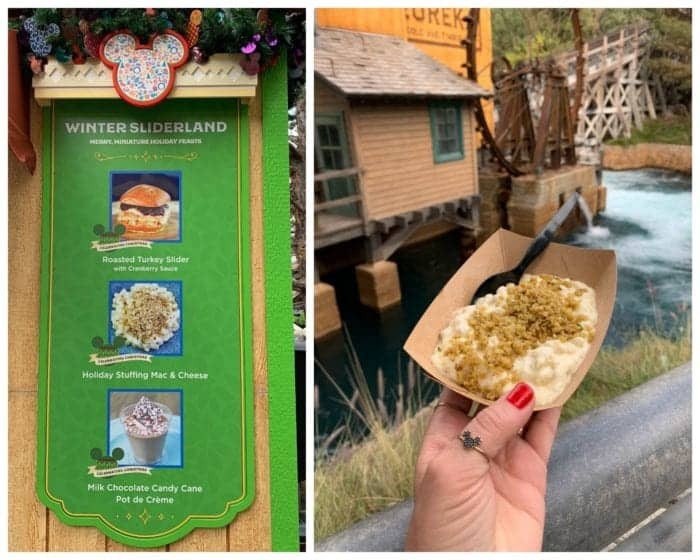 There is so much to EAT at Festival of Holidays. Hope you’ve enjoyed some of my favorites. Looking forward to trying a few more plates soon!